A recent study indicates that Indian analytics, data science and big data industry is estimated to be $2.71 billion in revenues and growing at a healthy rate of 33.5% CAGR. This suggests that Indian domestic firms are doing quite well for themselves and is slowly becoming deep-rooted with its presence in various industries. Tapping on to the growing analytics industry, this year’s study on the state of analytics at domestic firms in India aims to bring a quick insight into how the analytics scenario is evolving in the domestic market. We looked at 50 large Indian firms across industries that have adopted analytics to improve business. These companies are from industries such as auto, private banks, public banks, financial services companies, infrastructure, steel, power, telecommunications, utilities, ecommerce, oil drilling and refineries. This year we collaborated with Insofe, a leading data science education provider, to bring out this study. Read our last year’s study here. Analytics penetration is a metric that denotes the degree of infusion of analytics function in an organisation. It quantifies the approximate number of analytics professionals employed by the organisation for every employee within the whole firm. So, a penetration of 1% should be read as 1 analytics or data science professional for every 100 employees with an organisation. Analytics adoption is calculated at a penetration of less than 0.75% i.e. an organisation does not even have one analytics professional to support 133 employees within the organisation. Or it can be said that if a company has adopted analytics, then it would have at least one employee to support every 133 employees. The overall adoption of analytics & data science at large Indian firms is around 64%. That’s a healthy adoption rate given most of these large firms are into traditional businesses like energy & utilities. Telecom, financial services, ecommerce & private sector banks have almost 100% adoptions rates. There is some level of analytics & data science being executed in these organisations, especially the large ones. Infrastructure sector has almost no adoption of analytics. On an average, large Indian firms have an analytics penetration of 2.8%. This essentially implies that for every 36 employees in an organisation, 1 employee is in some shape and form associated with data and analytics. Analytics penetration is typically higher for new age ecommerce firms and lower for traditional firms in India. 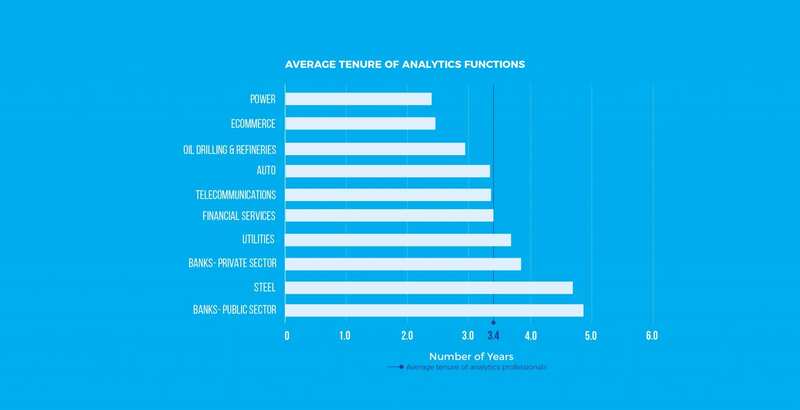 The average tenure of analytics professionals at Indian firms is 3.4 years. Public sector banks, even though with low adoption have the highest analytics tenure among India firms, at almost 5 years. On the other hand, ecommerce firms, with high adoption of analytics, have a much lower analytics tenure at 2.5 years. 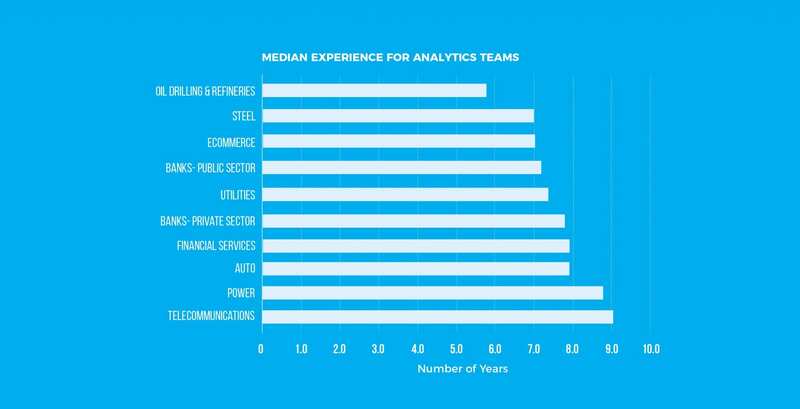 The median experience level of analytics professionals with Indian firms is 7.5 years. Analytics professionals in Indian telecom firms have the highest experience at 9 years. Oil drilling & refineries have the lowest at 5.9 years. 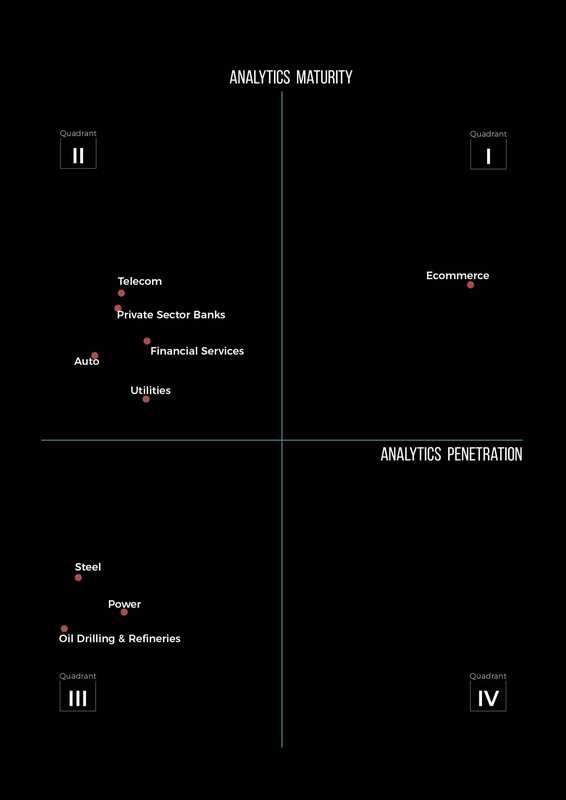 Like the previous year, here we analysed various sectors on the basis of analytics penetrations and analytics maturity. Unlike last year, there does not seem to be a correlation between maturity & penetration. Till last year, maturity and penetration were negatively correlated implying that as firms grow in terms of their analytics penetration, they tend to lose on depth and maturity. This might be changing now as firms are getting more mature in deploying their analytics solutions. Ecommerce is the only sector to be in the first quadrant, which signifies that it is both high on penetration and maturity. Data science forms the core to ecommerce sector and all mid to large ecommerce firms have some form of analytics adoption within the firm. The highest number of sectors lie in quadrant II. 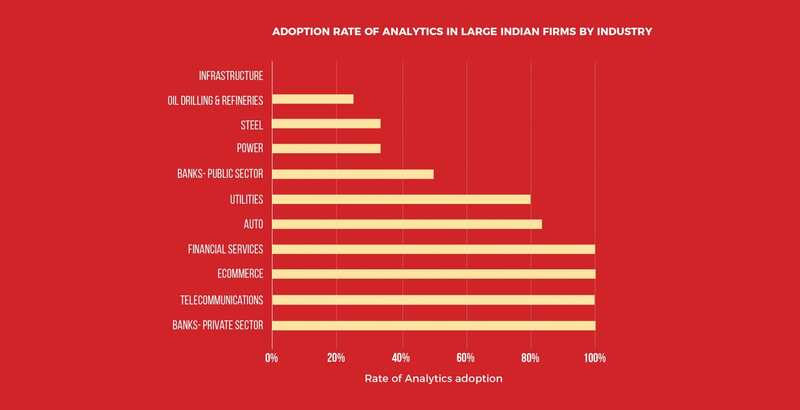 This is good indication of adoptions as well as relative maturity of analytics functions within these sectors. The analytics build-up for ecommerce is so high that it makes other sectors almost appear in a vertical line (have same penetration). Inmobi has the highest penetration of analytics and data science. Traditional businesses with large overlap with either government and/or manufacturing are in quadrant III, signifying both low relative maturity and penetration than other sectors. This can be either due to slower adoption, the design of the organisation itself or lack of use cases. Private sector banking in India score high on maturity of analytics and data science deployed in the organisations, which is slightly lower than telecom and ecommerce industry. Finance & operations are the two primary functions where private sector banks deploy analytics. Marketing is the third function where analytics gets deployed. Mumbai is the top city where analytics functions of private Indian banks functions. Public sector banking in India has the lowest analytics penetration among other sectors, and just slightly higher than oil drilling and refineries sector. We looked at eight large public-sector banks and just four out of them seem to have some level of adoption of analytics. 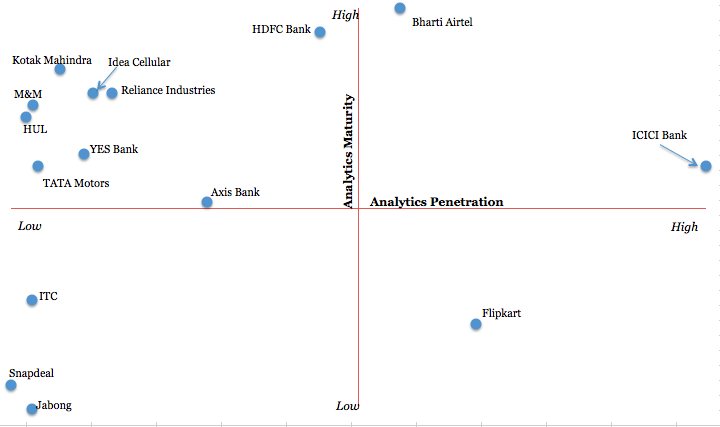 Union Bank of India & IDBI Bank have the largest analytics penetration among their peers. Again, Mumbai is the top city where analytics functions of public Indian banks functions. Given the focus that GoI has on latest technologies, it would surely be most applicable in the public sector banks in India. Auto sector has high adoption rate of analytics and data science. 5 out of 6 auto companies in India have some form of analytics adoption. Mahindra & Mahindra have the highest penetration of analytics & data science relative to its peers. It also has the highest maturity. Most analytics functions in auto industry supports the sales and business development units. Most analytics functions in auto industry are based out of Mumbai, followed by NCR. Ecommerce has emerged as one of the largest adopters of analytics and is evident with their focus on hiring senior analytics professionals. It is the leading sector in India in terms of both analytics penetration and maturity. Inmobi has the highest penetration of analytics & data science compared to its peers. It also has the highest maturity. Inmobi is followed by Shopclues in terms of analytics penetration. Most analytics functions in ecommerce industry support the marketing and business development units; followed by operations and supply chain. We looked at 8 large-sized oil drilling & refinery companies in India. Analytics adoption is dismally low in this sector. Just 1 out of 4 large sized companies have some form of analytics adoption. This subsequently goes down further with mid-sized companies. Reliance Industry is leader in this space in terms of analytics adoption. Both in terms of penetration and maturity, RIL scores high. We looked at 5 large-sized utilities companies in India. 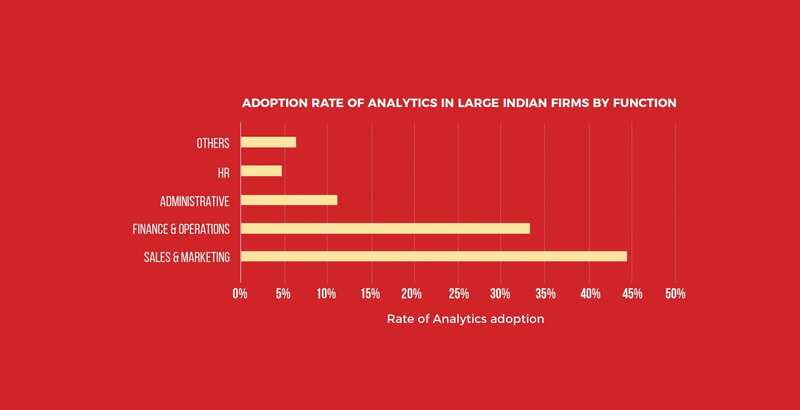 Analytics adoption is high in this sector. 4 out of 5 large-sized companies in this sector have some form of analytics adoption. Hindustan Unilever (HUL) is leader in this space in terms of analytics adoption. Both in terms of penetration and maturity, HUL scores high. The study is indicative of the fact the analytics adoption is witnessing a growth in various industries, including both large firms and traditional businesses. In terms of numbers, the overall adoption of analytics and data science in large firms is around 64% which is significantly high compared to last year. However, there are certain industries such as infrastructure that has almost no analytics adoption, and this could be due to lack of resources to set up analytics facility. Overall, we see ecommerce emerging as one of the largest adopters of analytics and this could be attributed to their focus on hiring senior analytics professionals in their team. In terms of analytics contributing to various functionalities, it was seen that around 44 percent analytics functions support sales and marketing groups, whereas 33% support finance and operations group.